Review of Dr. Fritz Briem 13th Century "Grut" Bier | Beer Apprentice - Craft Beer News, Reviews, Interviews and Info. Hello everyone. For today’s craft beer review I’m going to be enjoyihng a very special, rare and unique beer. It’s called the 13th Century “Grut” Bier produced by Professor Fritz Briem in Freising, Germany. This beer came highly recommended to me by Blake Layne from Chuck’s Wine and Spirits in Bowling Green, Kentucky. He said it would be like nothing I had ever tried before, so I’m really looking forward to sampling this thing. I had to revert to ratebeer.com to find a commercial description because, currently, no website is dedicated to this brew. Before the German Purity Law “Reinheitsgebot” of 1516 it was common practice to use any kind of different spices, herbs, fruits and other plants to provide balance to beer. Hops was not yet well known at this time. Grut bier has roots in many cultures and each culture had it’s own “special ingredients”: Egyptians, Native Americans, Arabian Tribes, Gaulles, Germanic Tribes and the Vikings. This interpretation of a traditional Grut Bier is spiced with Lorbeer (Bay Leaves), Ingwer (Ginger), Kummel (Caraway), Anis (Anise), Rosemarin (Rosemarie) & Enzian (Gentian). It is brewed with water, wheat & barley malt, “pollinated wild hops” and fermented using top fermenting yeast. – Dr. Fritz Briem Historic Signature Series. Man, I can’t wait to try this. This brew has an ABV of 4.6% and it comes in a 16.9 oz. bottle. The beer poured a very light honey to straw yellow color. It looked a lot like pineapple juice. It started clear, but as I poured the remainder of the bottle into the glass it became cloudy with sediment. The crown was a very bright white color of decent size. The retention time was adequate, but the lacing seemed sub par. The head was fluffy and smooth looking, but it had a very fizzy “sound”. It was comprised of very small, tight, soapy bubbles. The aroma revealed a ton of spices. Ginger, cloves, Rosemarie and fresh mint. Also detected was a fruity, sweet, apple cinnamon bouquet. It was very floral with underlying hints of wheat and grain. This was a very unusual and complicated nose, but it was oh so delightful and unique. All of the fragrances were congruently balanced and harmonized. There was so much going on that I couldn’t even begin to decipher everything. The taste brought forth all of the spice again, however they seemed to be a touch more relaxed. All were still easily noticed, such as the ginger, cloves and mint, plus they continued to be well blended and engaging. Much like the smell, a solid wheat base gave the flavor a well rounded and somewhat familiar profile. This taste is something to behold for sure. The mouthfeel was light, very smooth, mostly dry and crisp, however not very snappy. The carbonation was both lively and good. Some flavor was left on the palate, although it didn’t completely drench the mouth like I thought it might. I’ll tell ya. This beer is definitely unlike anything I have ever had. It’s totally unique, alluring and exclusive. I would highly recommend it if you can find it. It’s fairly easy to drink also considering all of the spices involved. I would be willing to bet that some may not like this beer do to that fact and that’s totally understandable. I’m going to have to score this beer relatively high just for the fact that it’s so rare and different. Not to mention that it’s pretty darn good too. 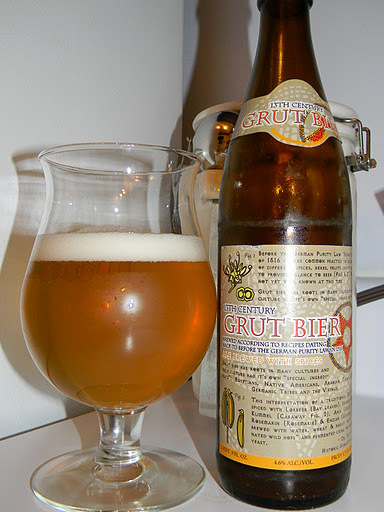 Have any of you guys ever tried the Dr. Frietz Briem 13th Century “Grut” Bier? If so, what did you think of it? Did you enjoy it? Feel free to leave a comment if you like. Thanks for reading and commenting everyone. I truly appreciate all of the support.